That the Islamic State (IS) detests the Shi'a- both the main body of Shi'a and the smaller sects and offshoots- is well known. But how exactly does IS classify those it deems the 'Shi'a sects'? 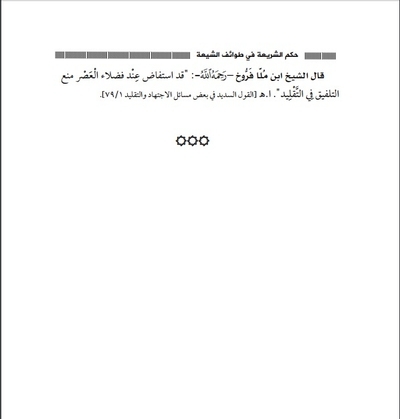 This small treatise, an output from the Office of Investigations and Studies (part of the Diwan al-'Iftaa' wa al-Buhuth: Fatwa Issuing and Investigations Department), helps clarify this issue. 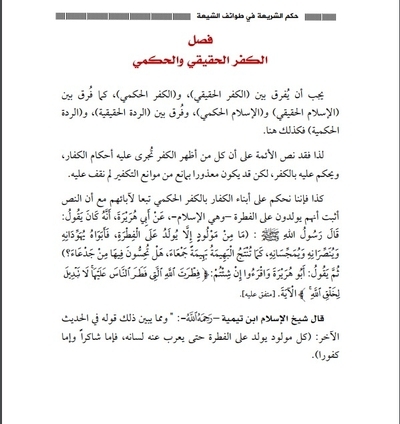 This treatise was not in fact published by IS' official media wings online, but was rather distributed on the ground. For a time, Cole Bunzel and I had been looking for this work but to no avail. Bunzel recently found it though and drew my attention to it. I have translated it in full as part of this post, with occasional explanatory clarifications in square brackets. The figure who is most likely the "amir" of the office that wrote the introduction to this treatise is the deceased Bahraini cleric Turki Binali. 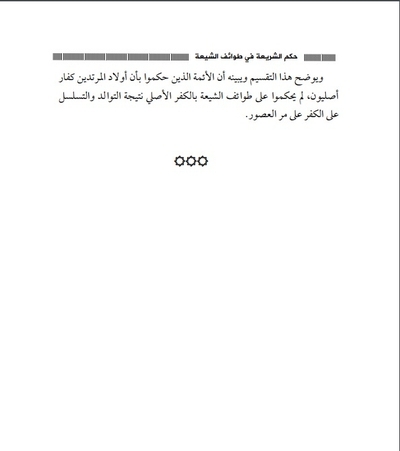 No official announcement of his death or eulogy has been published by IS for Binali, and this absence of an official announcement or eulogy has been taken as a suggestion that his internal critics now have the ascendancy in IS' main bodies of authority such as the Delegated Committee, with an apparent document even calling for the removal of textbooks likely written by him, such as the Course in Tawheed. 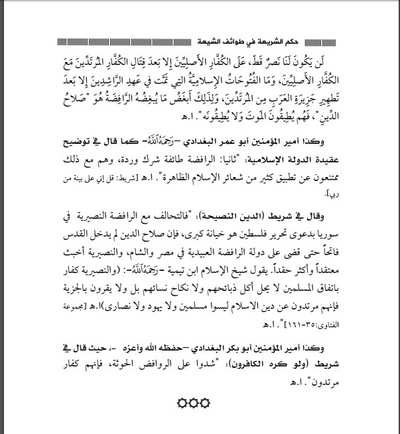 The central argument of this treatise, which going by some of the remarks in the conclusion appears to have been aimed at clarifying some doubts within the ranks of some younger members of IS about the status of the Shi'a and related sects in Islamic law (Shari'a), stipulates that the Shi'a, Alawites, Ismailis and Druze are not 'original kuffar' (i.e. original disbelievers in Islam like Jews and Christians), but are rather apostates: that is, people who have abandoned Islam. 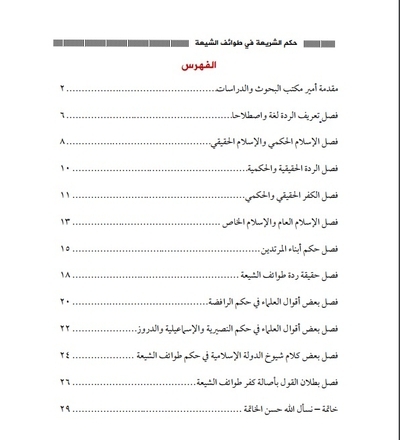 Note that the treatise makes an exception for Druze who do not claim to be Muslims, as many of them do not identify themselves as a sect of Islam, while others among them do. If there is no claimed affiliation with Islam, one cannot be an apostate. The stipulation of apostasy for the Shi'a and related/derived sects goes against an arguably intuitive stream of thought that might posit that with the passing of generations from the time of their ancestors' original apostasy from Islam, today's Shi'a are simply original disbelievers like the Jews and Christians, since they were not born into Islam. 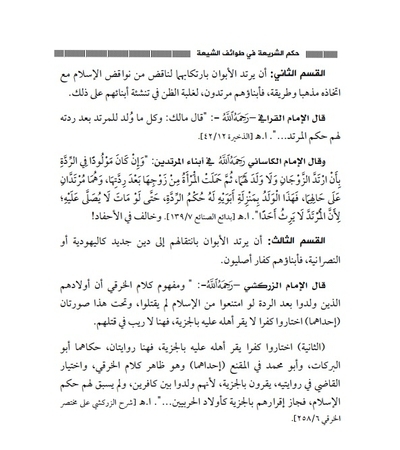 The conception of Shi'a as apostates is notably consistent with the line in the 'Islam 101' pamphlet issued by IS and published online by its 'al-Himma Library', called 'This is our 'Aqeeda and This is our Manhaj', which explicitly classifies the Shi'a as an apostate sect among the Muslims. Since apostasy is regarded as worse than original kufr (disbelief), then fighting apostasy and its adherents in their various forms is accorded priority. 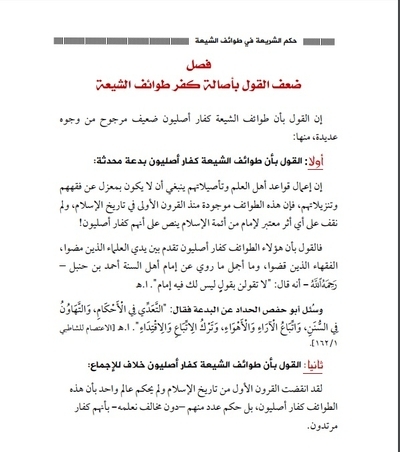 An illustration of this line of thinking comes in an extended quotation in this treatise from Abu Mus'ab al-Zarqawi's speech "Have you heard of the Rafidites?" 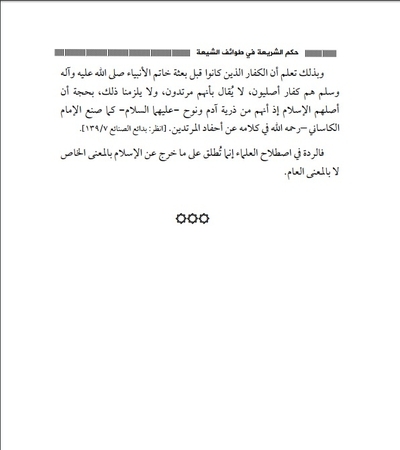 Zarqawi, speaking during the time of the U.S. occupation of Iraq, invoked a supposed precedent from the time of the Crusades to justify the idea of waging war on the Shi'a. Just as Salah al-Din did not retake Jerusalem from the Crusaders until after the end of the Shi'i Fatimid dynasty in Egypt, so today's jihadists will not defeat the Crusaders of this era until they destroy the Shi'a first. Zarqawi's view of history is simplistic, to say the least, but the reasoning is clear. As far as the citations and influences go, the Wahhabi concept of 'nullifiers' of Islam unsurprisingly comes up, a key foundation on which IS conceptions of falling into kufr and apostasy are based. Both the founder of the Wahhabi trend and subsequent scholars like Suleiman bin Sahman are cited in this work. The medieval Hanbali scholar Ibn Taymiyya, known for his virulently anti-Alawite views in particular, also features in this treatise on multiple occasions, just as he features in other IS theology books. 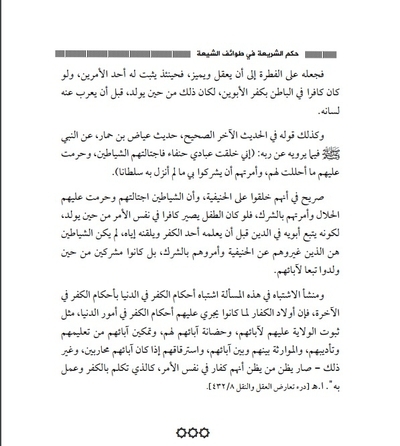 At the same time, however, one of the main points this treatise invokes to support its central argument that the Shi'a are apostates is that the view of Shi'a as apostates was held by the traditional Sunni jurists and theologians, whereas the view of them as original disbelievers is an innovation deviating from tradition. Some sayings on the Shi'a quoted in this work are traced back to some of the early imams and hadith narrators in Sunni Islam, like Muhammad bin Yusuf al-Faryabi and Talha bin Masraf. These sayings were quoted in later Sunni theology works such as Sharh Usul 'Itiqad Ahl al-Sunna wa al-Jama'at ("Explaining the principles of the doctrine of the Ahl al-Sunna wa al-Jama'at: a work by Imam al-Lalika'i) and al-Ibana al-Sughra (a work by Ibn Batta, a Hanbali jurist of the 10th century CE). The renowned Persian theologian al-Ghazali, a Shafi'i, is also quoted in this work with regards to his views on adherents of 'Batini' thought, in particular referring to the Ismailis. Ibn 'Abidin, a Syrian jurist of the Hanafi school of jurisprudence, is cited with regards to the Druze in particular. It should be noted though that this treatise gives a somewhat misleading picture of Ibn 'Abidin's view of the Druze. While he did consider them outside of the fold of Islam, he also wrote in the same work quoted by this treatise: "It is not hidden that their [Druze et al.] establishment on the two Shahadas with this evil doctrine does not place them in the ruling of the apostate for lack of credence." 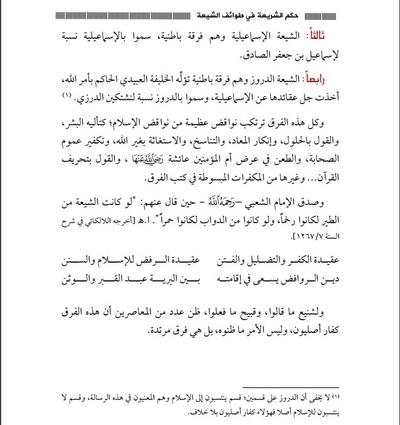 The IS notion of not deviating from tradition also explains the attempt to give an overview where necessary of differing views of the four main schools of Sunni jurisprudence (Maliki, Shafi'i, Hanbali and Hanafi), as part of the background on the general concept of apostasy and the subject of definitions. This approach again illustrates that one cannot claim that IS rejects the four schools of jurisprudence. The sects of the Shi'a are numerous, and all of them are sects that claim affiliation with Islam, and claim loyalty to Ali bin Abi Talib (may God be pleased with him), therefore they are called Shi'a. 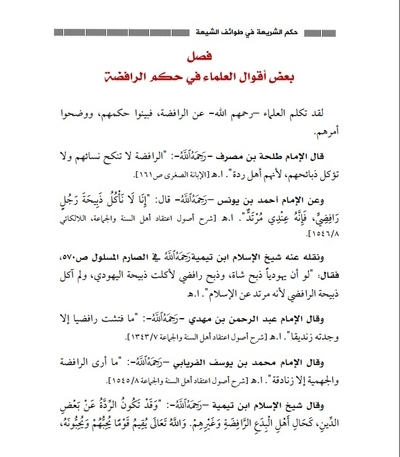 Imam Ibn Batta al-'Ukbar- may God have mercy on him- said about the Shi'a: "The people strongest in disagreement, divergence and attacking each other, for each one chooses a madhhab for himself and curses the one who disagrees with him on it, and declares takfir on the one who does not follow it" (al-Ibana al-Kubra: 2/556). 1. The Twelver Imamate, Ja'afari Rafidite Shi'a, called the Imamate because they have made the Imamate the foundational cause that drives them, and they are called Twelver because they have said that there were twelve Imams, the last of whom entered the cave in Samarra according to their claim. They are called Ja'afaris in derivation from Imam Ja'afar al-Sadiq (may God have mercy on him), and they are called Rafidites because they rejected the Imamate of the two sheikhs and then rejected Islam. 2. The Alawite Nusayri Shi'a and they are a Batini sect that appeared in the third century of the Hijra, and they are called Nusayris in relation to the founder of the sect Muhammad bin Nusayr al-Basri al-Numayri (died in 270 AH), and they called Alawis in relation to Ali bin Abi Talib (may God be pleased with him). 3. The Ismaili Shi'a and they are a Batini sect, called Ismailis in relation to Ismail bin Ja'afar al-Sadiq. 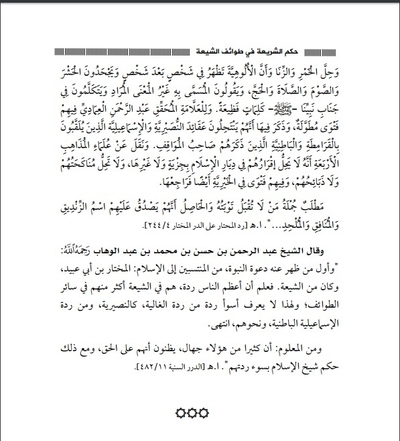 And all these sects commit great nullifiers from the nullifiers of Islam, like deifying humans, professing the doctrine of hulul [divine incarnation], condemning the concept of the Resurrection, transmigration of souls, calling for help in one besides God, declaring takfir on the mass of the companions, attacking the honour of the Mother of the Believers A'isha (may God be pleased with her), and professing that the Qur'an has been distorted, and other things from plain acts of kufr in the books of these sects. And Imam al-Sha'abi- may God have mercy on him- spoke the truth when he said about them: "Had the Shi'a been from among the birds, they would have been vultures, and had they been from the riding animals, they would have been donkeys"- (brought out by al-Lalka'i in Sharh al-Sunna 7/1267). A doctrine of kufr, error, and strife, a doctrine of rejecting Islam and the Sunnas. The religion of the Rafidites strives in its establishment among men for the worship of the grave and idols. And for the repulsiveness of what they have said, and the ugliness of what they have done, many of the contemporaries have thought that these sects are original kuffar, but the matter is not what they have thought, but rather they are apostate sects. And the last of our calls is praise be to God the Lord of the Worlds, and God's blessings and peace be upon the most noble of the prophets and those sent. The precepts from the Book of God and the Sunna of the Messenger of God (God's peace and blessings be upon him and his family) have brought mention of apostasy and committing apostasy. Apostasy is taken from 'going back' in the Arabs' language, and therefore the 'ulama- may God have mercy on them- agreed that apostasy in the language is 'going back', so all the sources of the language agree that the notion of apostasy goes back to the notion of going back on something. As a technical term: the definitions of the 'ulama- may God have mercy on them- have differed on the truth of apostasy and the apostate, for some of the 'ulama say that apostasy is going back from the faith as some of the Hanafi jurists- may God have mercy on them- define it. Imam Abu Bakr al-Kasani al-Hanafi- may God have mercy on him- said: "As for the principle of apostasy, it is carrying out the word of kufr on the tongue after the presence of faith, so apostasy is an expression of going back on faith" (Bada'i al-Sana'i- 7/134). And some say: the kufr of the Muslim, as a group of the 'ulama have defined it, among them the Maliki jurists. Abu al-Abbas al-Sawi al-Maliki- may God have mercy on him- said: "Apostasy is the kufr of the Muslim in an open sense of declaration, or words that necessitate kufr, or doing something that includes kufr"- (al-Sharh al-Saghir- 6/144). And some of them say: cutting off Islam, as the Shafi'i jurists define it. Shams al-Din al-Sharbini al-Shafi'i- may God have mercy on him- said: "Apostasy is cutting off Islam intentionally, equally whether doing or saying something in mockery, or out of pigheadedness, or creed"- (Mughni al-Muhtaj- 4/133). And some say: going back on Islam, as the Hanbali jurists define it. Imam Ibn Qudama al-Hanbali- may God have mercy on him- said: "The apostate is the one who returns from the religion of Islam to kufr"- (al-Mughni 9/3). Those of the four madhahib are agreed in the meaning of apostasy even if their expressions differ, for all of the have defined it as going back on Islam, and this is the evidence of the Qur'an. God Almighty said: "And they will continue fighting you till they make you turn away from your religion if they can, and whoso among you apostasises from his religion is a kafir, and the deeds of those people have come to naught in this world and the Hereafter, and those people are companions of the fire, in which they will abide forever"- al-Baqara 217 [Qur'an 2:217]. And God Almighty said: "Oh you who believe, whoso among you apostasises from his religion, God will bring a people whom He loves, and they love him, humble to the believers and powerful against the disbelievers, striving in the path of God, and they do not fear the censure of a critic. This is God's grace that He bestows on whoso He wishes. 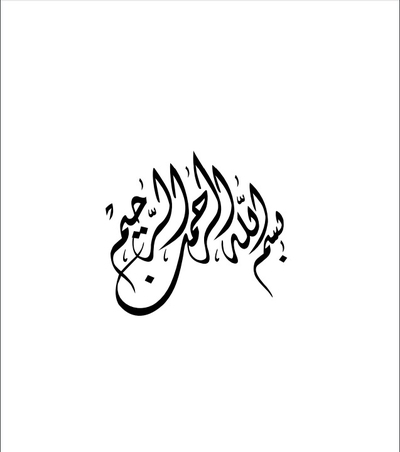 God is all-Encompassing, all-Knowing"- al-Ma'ida 54 [Qur'an 5:54]. The one who bears the bond of Islam- there is no deity but God- or claims affiliation with Islam or shows something from its outward rituals, the ruling for him is Islam, and upon him has come the rulings of Islam in this world, and this is known as "Islam in the Legal Sense." And if he is outwardly and inwardly a believer, and bears the conditions of there is no deity but God, and avoids its nullifiers etc., he is a Muslim in truth, and for him are the rulings of Islam in this world and the Hereafter, and this is known as "True Islam." As for the one who should commit one of the nullifiers of Islam we have not reviewed, or if he has not fulfilled some of the conditions of there is no deity but God, or if he outwardly shows Islam and inwardly bears kufr, for him is "Islam in the Legal Sense" only, and not true Islam. The Sheikh of Islam Ibn Taymiyya (may God have mercy on him) said: "And in this they have replied concerning this proof, for when it is said to them that the Muslims have agreed that the kafir wants to become Muslim, it suffices from him to affirm the two shahadas. They say: 'Indeed we are content with him in that to carry out Islam upon him.' For the One of the Law [God] made it a sign for implementing the rulings. But if that were true faith He would not have said regarding the muhajir women: 'Oh you who believe, if believing muhajir women come to you, examine them. God is all-Knowing of their faith'- (Dir' Ta'arudh al-Aql wa al-Naql- 7/437). Imam Ibn Abi al-Izz al-Hanafi- may God have mercy on him- said: "And there are issues on which the jurists speak, like the one who prays and does not profess the two shahadas, or bears something besides that from the particulars of Islam but does not profess them. Is he a Muslim or not? And the truth is that he is a Muslim in all that is from the particulars of Islam" (Sharh al-Tahawia- 75). Therefore know that anyone who professes affiliation with Islam and bears something that nullifies it is an apostate, so the sects that claim affiliation with Islam like the Shi'a sects are apostates, not original kuffar. And we have not come to know a transmission from one of the predecessor imams that designated the one who has claimed affiliation with Islam and has fallen into disbelief an original kafir. It must be known that the one who embraces Islam outwardly and inwardly but then commits one of its nullifiers is an apostate in the true sense, because he has cut off Islam or gone back on it. As for the one who bears Islam outwardly then nullifies it, or professes affiliation with Islam then resolves upon himself that he was not Muslim at all, he is an apostate in the legal sense rather than the true sense, as he is in his true nature an original kafir. The 'alama Suleiman al-Bajirmi al-Shafi'i (died in 1221 AH) said: "And this is the definition of true apostasy, as for the son of the apostate who was bound into apostasy, he is an apostate in the legal sense because Islam was not cut off from him...Likewise the atheist, even if he cut off Islam outwardly, is not called an apostate in the true sense because there was no Islam in him to cut off, so his apostasy is in the legal sense" (Hashiyat al-Bajirmi 'Ala al-Khatib- 4/237). Therefore it is known that the Shi'a sects are apostates in the legal sense, even if they have not fulfilled the conditions of the shahada from the outset. One must distinguish between true kufr and kufr in the legal sense, just as a distinction is made between true Islam and Islam in the legal sense, as well as there being a distinction between true apostasy and apostasy in the legal sense. Likewise here. For the Imams stipulated that all who show kufr have the rulings of kufr upon them, and is judged in kufr, but he may be excused in one of the impediments to takfir we have not come to know. So we judge the children of the disbelievers with kufr in the legal sense following their parents, even as the text has established that they are born in fitra- i.e. Islam- on the authority of Abu Huraira, who said: "The Messenger of God (SAWS) said: 'It is not that the one who is born should be born except in fitra, so it is the child's parents that make him a Jew, Christian and Majusi, just as the animal delivers a whole animal. Do you perceive it as mutilated?' Then Abu Huraira said: 'Recite if you will- 'The fitra of God on which He has created the people, there is no replacement for God's creation'- the aya' [Qur'an 30:30]"- (agreed upon). The Sheikh of Islam Ibn Taymiyya (may God have mercy on him) said: "And there is that which clarifies the Almighty's words in the other hadith: Every child is born on fitra until his tongue can utter it, whether thankful or ungrateful. It is clear they [men] have been created in the hanif state, and the Shayateen have caused them to deviate, forbidden upon them what is permitted, and ordered them to commit shirk, so if the child were to become a disbeliever in the same state from the time of his birth, for the fact that he follows his parents in the religion before someone teaches him disbelief and instils him with it, the Shayateen were not the ones who deviated them from the Hanif state and ordered them to commit shirk, but rather they were mushrikeen from the time of their birth following their parents. And the source of misgiving in this issue is the fact that the rulings of kufr in this world are confused with the rulings of kufr in the Hereafter, for the children of the kuffar, since they have been dealt with by the rulings of kufr in the matters of this world, like the establishment of guardianship upon them for their parents, and their parents' nurturing for them, and the fact that their parents can teach them and educate them, and inheritance between them and their parents, and their enslavement if their parents were among those waging war, and things besides that- thus has come about the opinion of the one who thinks that they are kuffar in the same state, as the one who professes kufr and acts on it"- (Dir' Ta'arudh al-Aql wa al-Naql- 8/432). One may use the term Islam in the law with the general meaning, which is Islam facing towards God, obeying Him, worshipping Him alone, disavowing shirk, belief in the prophets, the principle, the resurrection etc. And this is the religion of all the prophets. The Sheikh of Islam Ibn Taymiyya (may God have mercy on him) said: "All the Prophets were sent with the religion of Islam for it is the religion besides which God does not accept, not from the first nor from the last"- ('al-Abudiya 115-6). And the term Islam may be used in the particular sense: the religion with which Muhammad (SAWS and on his family) was sent in doctrine, Shari'a and ethics. Imam al-Baghawi (may God have mercy on him) said: "The religion of Islam is following the Qur'an"- (Tafsir al-Baghawi- 1/13). Imam al-Barbahari (may God have mercy on him) said: "Know that Islam is the Sunna"- (Sharh al-Sunna: 133). God Almighty said: "And I have been ordered to be the first of the Muslims." Al-Siddi said: "Meaning from the Ummah of SAWS" (see: Tafsir Ibn Kathir 6/83). And Imam al-Shawkani (may God have mercy on him) said: "i.e. From this Ummah" (Fath al-Qadir 3/454). Thus, know that the kuffar who were before the sending of the seal of the Prophets (SAWS and on his family) are original kuffar. It is not said that they are apostates, and we are not bound to that on the grounds that their origin is the Islam as they are from the offspring of Adam and Noah- peace be upon them- as Imam al-Kasani- may God have mercy on him- formulated in his discussion of the descendants of the apostates (see Bada'i al-Sana'i 7/139). So apostasy in the technical term of the 'ulama is rather applied to the one who leaves Islam in the particular sense, not the general sense. There has not come a clear stipulation from the Book and Sunna regarding the ruling on the children of the apostates, therefore the Imams have differed in their pronouncements. 1. The fact that the parents apostasise in their committing one of the nullifiers of Islam concerns them, like blasphemy against God Almighty or supporting the kuffar over the Muslims, and the like, so their children are Muslims in principle if they claim affiliation with Islam, and the predominant opinion is that their children are established on Islam. On the authority of Abu Huraira (may God be pleased with him): he said: "the Prophet (SAWS) said: 'It is not that the one who is born should be born except in fitra, so it is the child's parents that make him a Jew, Christian and Majusi, just as the animal bears an animal whole. Do you perceive it as mutilated?' Then Abu Huraira (may God be pleased with him) said: 'The fitra of God on which He has created the people,'" (agreed upon). So Imam al-Nawawi (may God have mercy on him) said regarding the one whose parents have become apostates: "As for the apostate's son, if he is separated, or bound before the apostasy, he is a Muslim; even if a pregnant mother apostasises, the child is not judged in apostasy, but if he comes of age and expresses kufr, he is an apostate himself"- (Rawdhat al-Talibeen: 10/77). And what he said in that is for the most likely thought. 2. That the parents who apostasise by their committing one of the nullifiers of Islam with the adoption of it as a madhhab and path, so their children are apostates, for it is most likely that the children are raised on that. Imam al-Qarafi (may God have mercy on him) said: "Malik said: All born to an apostate after his apostasy has the ruling of the apostate"- (al-Dhakira 12/42). Imam al-Kasani (may God have mercy on him) said on the children of the apostates: "If he is born in apostasy by the fact that the spouses apostasised when they didn't have a child, and then the wife became pregnant from her husband after her apostasy, and the two are apostates in their state, so this child in the care of his parents has for him the ruling of apostasy, even if he dies, he is not to be prayed for, because the apostate is not the heir of anyone" (Bada'i al-Sana'i- 7/139). But he disagreed on descendants! 3. That the parents apostasise by their conversion to a new religion like Judaism or Christianity, so their children are original kuffar. Imam al-Zarkashi (may God have mercy on him) said: "And the understanding of al-Kharqi's words is that their children who were born after the apostasy, even if they refrain from Islam, are not automatically to be killed, but in this regard are two conceptions. (One of the two) is that they have chosen kufr in which its people are not established with jizya, so here there is no doubt in killing them. 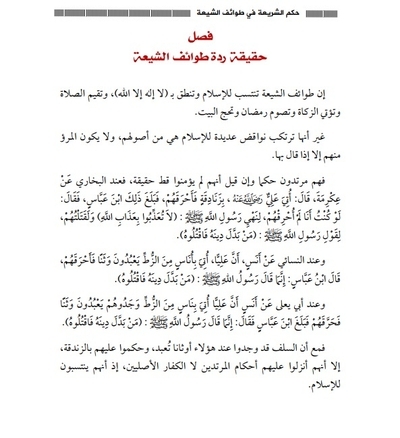 (The second) is that they have chosen kufr in which its people are established with jizya, and here are two reports: one is reported by Abu al-Barakat, and Abu Muhammad in al-Muqni', and it is the literal meaning of al-Kharqi's words, and the judge's choice in his two reports: they are established in jizya, because they were born among kafirs, and the ruling of Islam did not apply to them previously, so he allowed for them to be established in jizya as the children of those at war..." (Sharh al-Zarkashi on the Mukhtasir al-Kharqi 6/258). This distinction makes clear and clarifies that the imams who judged that the children of apostates are original kuffar did not rule on the Shi'a sects that they adhere to original kufr as a result of successive birth and succession on kufr with the passing of eras. The Shi'a sects claim affiliation with Islam, profess that there is no deity but God, establish prayer, give zakat, fast in Ramadan and perform the Hajj. But they commit numerous nullifiers of Islam that are from their principles, and man will not be one of them except when he professes them. So they are apostates in ruling even if it is said that they have not believed at all, for in al-Bukhari from Ikrima, who said: "Some heretics were brought to Ali- may God be pleased with him- so he burnt them, so that reached Ibn Abbas, who said: 'Had I been in his place, I would not have burnt them, for the Messenger of God (SAWS) forbade it- 'Do not punish with the punishment of God.' I would have killed them per the words of the Messenger of God (SAWS): 'Whoso changes his religion, kill him.'" And in al-Nisa'i from Anas: that Ali was brought people of al-Zutt who were worshipping idols, so he burnt them, and the news reached Ibn Abbas, who said: 'Indeed the Messenger of God (SAWS) said: 'Whoso changes his religion, kill him.'" And in Abu Ya'ala from Anas: that Ali was brought people of al-Zutt whom they found worshipping idols, so he burnt them, and the news reached Ibn Abbas, who said: 'Indeed the Messenger of God (SAWS) said: 'Whoso changes his religion, kill him.'" So despite the fact that the predecessors found among these people idols being worshipped, and ruled on them as heretics, they brought on them the rulings of the apostates, not original kuffar, as they claimed affiliation with Islam. 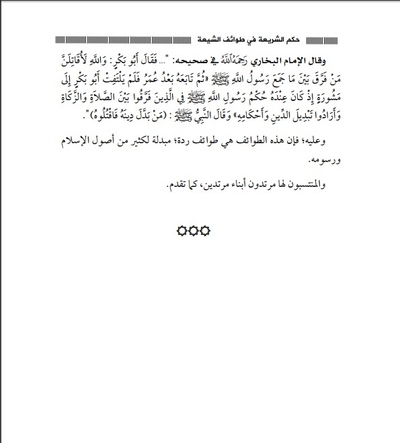 Imam al-Bukhari- may God have mercy on him- said in his authentic collection: "...So Abu Bakr said: By God I should certainly fight the one who has caused separation between what the Messenger of God (SAWS) brought together, then later Omar followed him and Abu Bakr did not consider consultation as there was with him the ruling of the Messenger of God (SAWS) on those who caused separation between prayer and zakat and wanted to change the religion and its rulings, and the Prophet (SAWS) said: 'Whoso changes his religion, kill him.'" Thus, these sects are sects of apostasy, exchanging many of the principles of Islam and its designs. And those affiliated with them are apostates, children of apostates, as presented. The 'ulama- may God have mercy on them- spoke about the Rafidites, and made clear the ruling on them and clarified their status. Imam Talha bin Masraf (may God have mercy on him) said: "The women of the Rafidites are not to be married and the meat of the animals they slaughter not to be eaten, because they are a people of apostasy" (al-Ibana al-Sughra 161). And from Imam Ahmad bin Yunis (may God have mercy on him) who said: "We do not eat the meat of the animal slaughtered by a Rafidite man, as he is in my eyes an apostate" (Sharh Usul 'Itiqad Ahl al-Sunna wa al-Jama'at, al-Lalika'i 8/1546). And transmitted from him by the Sheikh of Islam Ibn Taymiyya (may God have mercy on him) in al-Sarim al-Maslul 570, who said: "Were a Jew to slaughter sheep, and were a Rafidite to do it, I would eat the meat of the Jew, and I have not eaten the meat of the Rafidite because he is an apostate from Islam." Imam Abd al-Rahman bin Mahdi (may God have mercy on him) said: "I have not looked into a Rafidite and did not find him to be a heretic" (Sharh Usul 'Itiqad Ahl al-Sunna wa al-Jama'at 7/1343). Imam Muhammad bin Yusuf al-Faryabi (may God have mercy on him) said: "I only see the Rafidites and Jahmis as heretics" (Sharh Usul 'Itiqad Ahl al-Sunna wa al-Jama'at 8/1545). 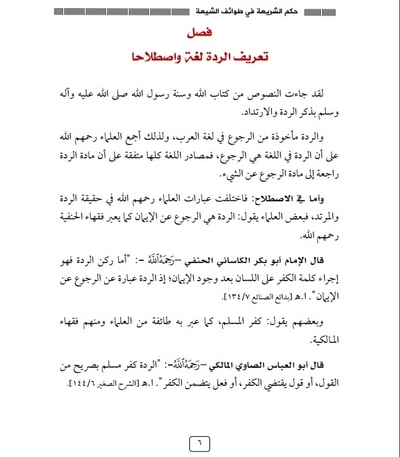 The Sheikh of Islam Ibn Taymiyya (may God have mercy on him) said: "And there may be apostasy from some of the religion, as is the state of the people of Rafidite innovations and others besides them, and God Almighty will establish a people He loves and they love Him, and will wage jihad against the one who apostasises from the religion or some of it, as He will establish the one who wages jihad against the Rafidite apostates from the religion, or from some of it, in every age. And God- Exalted is He- is the One responsible for making us among those he Loves and they love Him, who will wage jihad on the apostates and the followers of the apostates, and they do not fear the censure of the critic" (Manhaj al-Sunna 7/222). 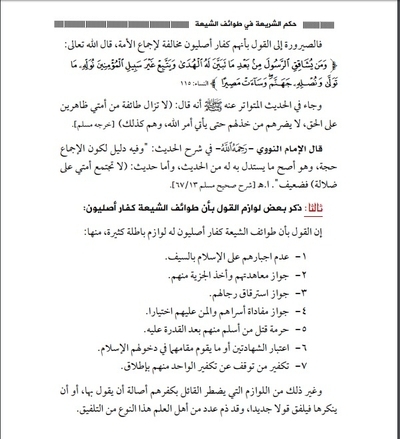 Abu Hamid al-Maqdisi (may God have mercy on him) said after he mentioned most of the doctrines of the Rafidites: "It is not hidden to anyone of insight and understanding from the Muslims, that most of what we have presented in the chapter previously regarding the doctrines of this Rafidite sect despite the difference of their types is plain kufr, and pigheadedness with ugly ignorance. The one familiar does not stop with takfir of them, and the ruling on them in deviating from the religion of Islam and their error"- (Risala fi al-Radd 'Ala al-Rafida li-Abi Hamid al-Maqdisi 200). The revivalist Sheikh Muhammad bin Abd al-Wahhab (may God have mercy on him) said: "These Imamates go outside the Sunna, but also the path [/faith of Islam]" (Risala fi al-Radd 'Ala al-Rafida li-Sheikh Muhammad 39). And Sheikh Suleiman bin Sahman- may God have mercy on him- said: "It is known that the Imamate Rafidites among all the Ahl al-Sunna wa al-Jama'at are not from the people of the Islamic path and way of Muhammad, but rather they are outside of them entirely" (al-Hujjaj al-Wadhiha al-Islamiya 77). 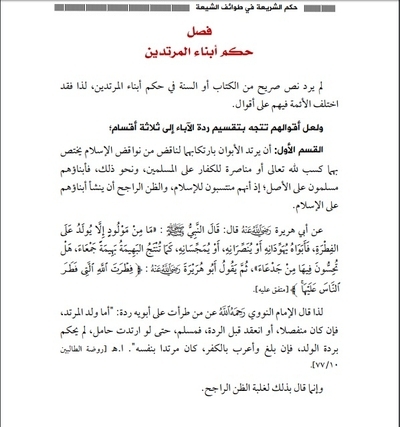 The words of the Imams- may God have mercy on them- on the apostasy of the Nusayris, Ismailis and Druze who claim affiliation with Islam is clearer than their words on the apostasy of the Rafidites. Imam Abu Hamid al-Ghazali- may God have mercy on him- said: "And the summary pronouncement is that there passes in them- that is, the Batiniya- the way of the apostates in view, blood, wealth, marriage, meat of the animals they slaughter, the authority of judgements and the extirpation of the acts of worship. 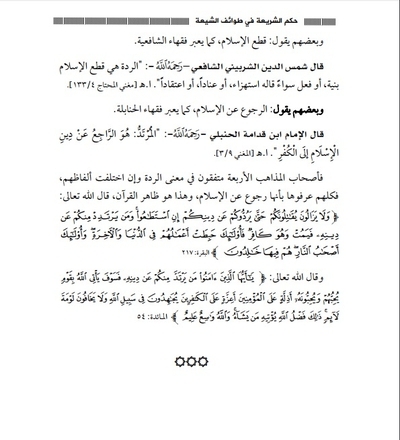 As for their lives, the way of the original kafir does not go through them as a distinction is made in the kafir between four characteristics- bestowal, ransom, enslavement and killing- and the distinction is not made with regards to the apostate...and it is obligatory to kill them and cleanse the face of the earth from them"- (Fada'ih al-Batiniya 156). 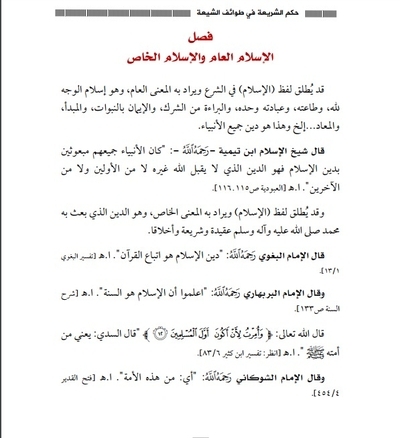 And the Sheikh of Islam Ibn Taymiyya (may God have mercy on him) said: "These Druze and Nusayris are kuffar by the agreement of the Muslims: it is not allowed to eat the meat of the animals they slaughter or marry their women, or even for them to be established on jizya, for they are apostates from the religion of Islam, not Muslims, Jews or Christians. They do not establish the obligation of he give prayers or the obligation of fasting in Ramadan or the obligation of the Hajj, or forbid what God and His Messenger forbade from forbidden meat, wine and other things, even if they outwardly the two shahadas with these doctrines, they are kuffar by agreement of the Muslims" (Majmu' al-Fatawa 35/161). the permissibility of wine and fornication, and that divinity appears in person after person, and they disavow the congregation, fasting, prayer and Hajj, and they say the attribute in name as something besides the desired meaning, and they speak hideous words about our honoured Prophet (SAWS). 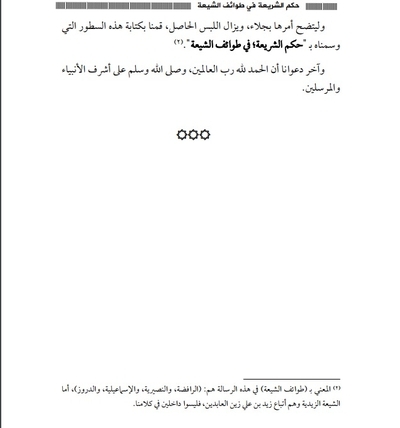 And the 'alama Abd al-Rahman al-Amadi verifying their case has an elaborate fatwa, in which he mentioned that they plagiarise the doctrines of the Nusayris and Ismailis who are called by the names of Qarmatians and Batinis whom the one of positions mentioned. And he transmitted from the 'ulama of the four madhahib that it is not allowed for them to be established in the abode of Islam with jizya or anything besides that, and it is not allowed to marry them or eat the meat of the animals they slaughter, and against them is a fatwa in benevolence as well so consult. Concerning the clause 'the one whose repentance should not be accepted,' in short the attribute of heretic, hypocrite and deviant applies to them..." (Radd al-Muhtar 'Ala al-Dir al-Mukhtar 4/244). Sheikh Abd al-Rahman bin Hassan bin Muhammad bin Abd al-Wahhab (may God have mercy on him) said: "And the first about whom the claim to prophethood appeared from those who claim affiliation to Islam: al-Mukhtar bin Abi Obeid, and he was from the Shi'a, so it has been known that the greatest people in apostasy are among the Shi'a, more than those in the other sects, and in this regard no worse apostasy is known than the apostasy of the ghulat, like the Nusayris, and the apostasy of the Batini Ismailis, and others besides them. Period. And it is known that many of these people are ignorant thinking they are on the way of truth, and despite that the Sheikh of Islam [Ibn Taymiyya] ruled on the evil of their apostasy" (al-Dorar al-Sunniya 11/482). 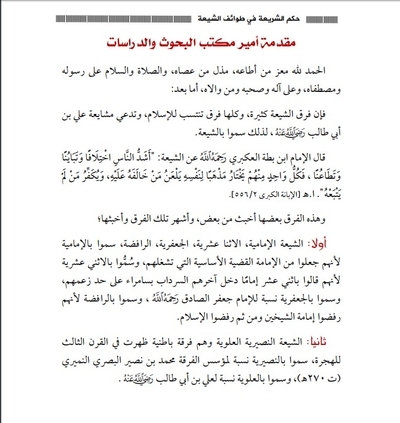 The Islamic State has adopted what the Imams of Islam of old and modern times adopted in the ruling on the Shi'a sects, and has not departed from their sayings with a new pronouncement. For its sheikhs, founders, and Shari'i elements noted the apostasy of the Rafidites. For Sheikh Abu Mus'ab al-Zarqawi (may God have mercy on him) made that clear in his series entitled 'Have you heard of the Rafidites?' And from what he said about them after he elaborated their doctrine: "The Muslims cannot be victorious or overcome the kuffar who wage war from the Jews and Christians except after annihilating those besides them from the apostate collaborators, at the head of whom are the Rafidites, just as history has observed for us how Bayt al-Maqdis [Jerusalem] that fell at the hands of Crusaders with the help of the Obeidi Rafidites was not recovered except at the hands of 'Salah al-Din,' even as 'Nur al-Din Mahmoud' was stronger against the Crusaders than 'Salah al-Din', but God Almighty determined that the victory and liberation of Bayt al-Maqdis should be at the hands of 'Salah al-Din', but when? 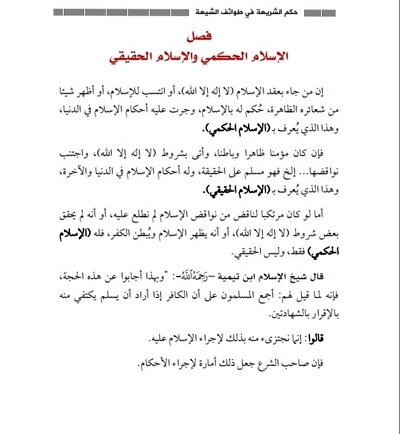 After he waged war on the Obeidi Rafidites for a number of years, and totally destroyed their state and brought it down, then after that he was freed up to take on the Crusaders until the victory over them came about for him, and he recovered Bayt al-Maqdis that remained for years under their grip because of the Rafidite people of betrayal. So this is a very important lesson that history offers us that can never be ignored. Victory will never arise for us over the original kuffar except after fighting the apostate kuffar with the original kuffar, and the Islamic conquests that were fulfilled in the era of the Rashideen were not so except after cleansing the Arabian Peninsula of the apostates, and therefore the one the Rafidites detest most is 'Salah al-Din,' for they tolerate death but do not tolerate him." And similarly the Amir al-Mu'mineen Abu Omar al-Baghdadi (may God have mercy on him) as he said in clarifying the creed of the Islamic State: "Secondly: The Rafidites are a sect of shirk and apostasy, and they are with that refusing to apply many of the outward rituals of Islam"- (recording: Qul Innani 'Ala Bayyinatin min Rabbi). And he said in the recording of "Religion is advice": "So the alliance with the Nusayri Rafidites in Syria on the grounds of liberating Palestine is a very great betrayal, for indeed Salah al-Din did not enter al-Quds in conquest except after destroying the Obeidi Rafidite state in Egypt and al-Sham, and the Nusayris are the most evil in creed and greatest in hatred. The Sheikh of Islam Ibn Taymiyya (may God have mercy on him) said: 'And the Nusayris are kuffar by the agreement of the Muslims, it is not allowed to eat the meat of the animals they slaughter, marry their women, and they are also not established on jizya, for they are apostates from the religion of Islam and they are not Muslims, Jews or Christians' (Majmu'at al-Fatawa 35-161). And likewise the Amir al-Mu'mineen Abu Bakr al-Baghdadi- may God protect him and strengthen him- when he spoke in the recording 'And even if the kafirs hate': "Be strong against the Houthi Rafidites, for they are apostate kuffar." 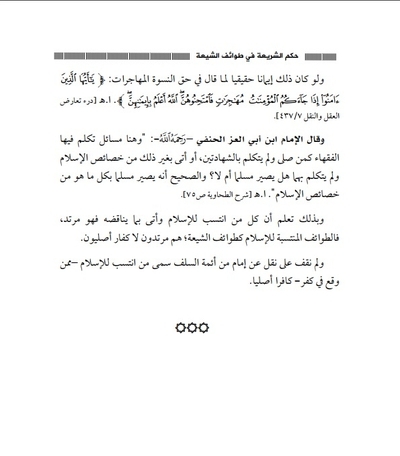 The works of the foundations of the Ahl al-'Ilm and their bases require that one must not be isolated from their jurisprudence and deductions, for these sects have been present since the first centuries of the history of Islam, and we have not come to know any considered trace for one of the Imams of Islam stipulating that they are original kuffar. For the pronouncement that these sects are original kuffar came after the 'ulama who passed, the jurists who judged, and the most beautiful expression is what has been narrated from the Imam of the Ahl al-Sunna Ahmad bin Hanbal- may God have mercy on him- that he said: "Do not say something for which you have no Imam." And Abu Hafs al-Haddad was asked about innovation, and said: "Attacking the rulings, and disregarding the Sunnas, following opinions and whims, and abandoning following and emulation" (al-'Itisam lil-Shatibi 1/162). 2. Saying that the Shi'a sects are original kuffar contravenes the consensus. The first centuries of Islam's history passed and not one 'alim ruled that these sects are original kuffar, but rather many of them- without disagreement we know of- ruled that they are apostate kuffar. So the outcome of saying that they are original kuffar is a contravention of the Ummah's consensus. God Almighty said: "Whoever opposes the Messenger after the guidance is made clear to him, and follows a path besides that of the believers, We will grant him what he has assumed and drive him to hellfire. And evil it is as a destination" (Nisa' 115) [Qur'an 4:115]. And there has come in the mutawatar [multiple chains of transmission] hadith from SAWS that he said: "A sect of my Ummah will remain open on the truth, and the one who forsakes them will not harm them until the decree of God should come, and they are so" (brought out by Muslim). Imam al-Nawawi (may God have mercy on him) said in explaining the hadith: "In it is evidence that consensus is a proof, and it is the surest thing to be inferred from the hadith, and as for hadith- 'My Ummah does not gather on error', it is weak"- (Sharh Sahih Muslim 13/67). 1. The lack of compelling them to Islam by the sword. 2. The permissibility of concluding a pact with them and taking jizya from them. 3. The permissibility of enslaving their men. 4. The permissibility of ransom for their captives and bestowal of magnanimity on them by choice. 5. The impermissibility of killing the one who accepts Islam among them after gaining power over them. 6. Considering the two shahadas or the equivalent as their entry into Islam. 7. Takfir of the one who refrains from takfir of one of them absolutely. And other inferences that the one who pronounces their kufr to be original must say, or he must condemn them and fabricate a new pronouncement, and many of the Ahl al-'Ilm condemned this type of fabrication. Sheikh Ibn Mulla Farukh (may God have mercy on him) said: "There has spread among the virtuous of the era the prohibition on fabrication in taqlid"- (al-Qawl al-Sadid fi Ba'adh Masa'il al-Ijtihad wa al-Taqlid"- 1/79). We have not endeavoured during the course of this treatise to make clear the doctrines of the Shi'a sects and come upon their principles, discuss them and respond to them, but rather we have been content to make clear the ruling on those sects in a summary that is not weak, with our concern in it for following and emulation, not innovation and beginning anew. Let us thus conclude this subject of discussion among some of the youth, and let us and them stand on making the issue a matter of principle and foundation, without being influenced by the agitated emotions in distorting the ruling on the matter. So we ask God to bless this effort and make it grow, in order for it to touch the bounds of hearts and minds. Our last call is praise be to God the Lord of the Worlds, and God's peace and blessings be upon the most noble of the Prophets and those sent. [i] It is not concealed that the Druze exist in two types: one claiming affiliation with Islam, and they are the ones meant in this treatise, and another not claiming affiliation with Islam in principle, such people being original kuffar without distinction. [ii] The meaning of "the Shi'a sects" in this book: they are the Rafidites, Nusayris, Ismailis and Druze. As for the Zaydi Shi'a, who are followers of Zayd bin Ali Zayn al-Abidin, they are not included in our discussion.